Objective: The aim of this study was to assess the knowledge, attitude and practice of B.Sc. Pharmacy students about usage and resistance of antibiotics in Trinidad and Tobago. Methods: This was a cross-sectional questionnaire-based study involving B.Sc. Pharmacy students. The questionnaire was divided into five components including Demographics data, knowledge about antibiotic use, attitude toward antibiotic use and resistance, self-antibiotic usage and possible causes of antibiotic resistance. Data were analyzed by employing Mann-Whitney and Chi-square tests using SPSS version 20. Findings: The response rate was 83.07%. The results showed good knowledge of antibiotic use among students. The overall attitude of pharmacy students was poor. About 75% of participants rarely use antibiotics, whereas self-decision was the major reason of antibiotic use (40.7%) and main source of information was retail pharmacist (42.6%). Common cold and flu is a major problem for which antibiotics were mainly utilized by pharmacy students (35.2%). Conclusion: The study showed good knowledge of pharmacy students regarding antibiotic usage. However, students' attitude towards antibiotic use was poor. The study recommends future studies to be conducted with interventional design to improve knowledge and attitude of pharmacy students about antibiotic use and resistance. The role of pharmacists is unequivocal in this war against antibiotic resistance. They are viewed as a more knowledgeable and resourceful healthcare professional to assist in infection control campaign. More importantly, community pharmacists are blessed to be called as a Gateway Practitioner. They have the significant opportunity to portray a prestigious role of promoting public health by their active participation in antibiotic stewardship program. The objective of this study was to assess the knowledge, attitude and practice (KAP) of BSc Pharmacy students toward antibiotic use and resistance. Our goal was to identify the knowledge gaps among pharmacy students to form the basis of effective interventions regarding their understanding of pharmacist's directed antibiotic stewardship program. A cross-sectional study was conducted for a period of 2 months in one of the major public sector university of Trinidad and Tobago. The data were collected with the approval of Head of the Department. Furthermore, the participation of students in this study was voluntary, and it was informed to the students that completion and submission of the questionnaire would be taken as their consent to participate in this study. High level of confidentiality and anonymity was maintained throughout the study. The year three- and four-pharmacy students were selected for this study. All the participants were briefed about the objectives of the study before requesting them to voluntary participate in this study. A total of 130 students were enrolled in the pharmacy school of studied University, and all the students were approached to participate in this study. A self-administered questionnaire was designed and used as a tool to collect the data from the participants. The questionnaire was designed by a thorough literature review of the related published studies, , after which the questions were short-listed to be included in the final questionnaire. The questionnaire consisted of five sections. The first section explored the demographic information such as gender, living status, and family residence. 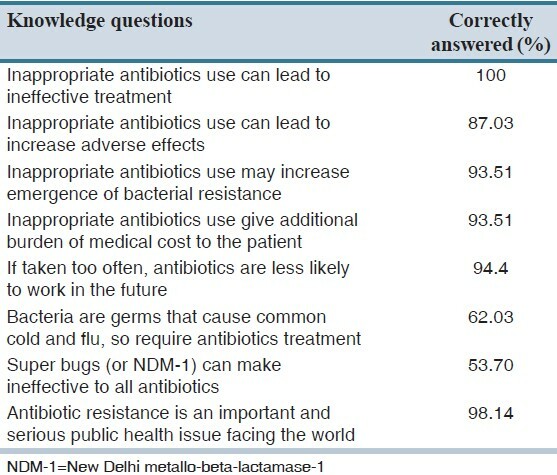 The second section, comprised of eight questions, evaluated the knowledge of participants about the use of antibiotics. The knowledge of participants was evaluated by asking questions regarding the effectiveness, adverse effects, resistance and economical concerns, policy issues and implication of antibiotic use. The third section assessed the attitude of respondents regarding antibiotic use and resistance. This section included five questions. The fourth part explored the self-antibiotic practices of pharmacy students such as frequency, reason, source, indication and type of antibiotic use. The last part of the questionnaire evaluated the students regarding their knowledge of possible causes of antibiotic resistance. Data were statistically analyzed using SPSS 20 for Windows (IBM Corporation, Armonk, New York). Descriptive analysis was employed, and the results were expressed in frequency and percentages. 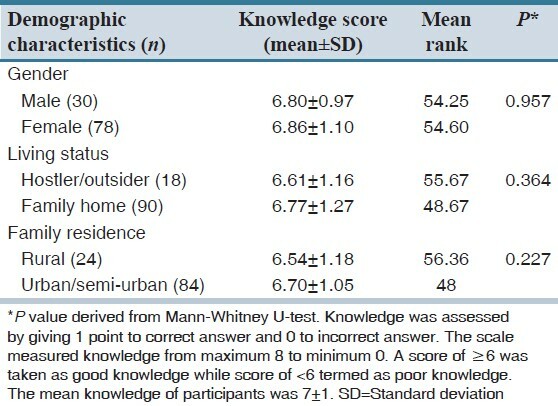 Nonparametric tests (Mann-Whitney U-test) were performed to inter-relate mean knowledge score and demographic variables. Chi-squares test was also used to assess the association between dependent and independent variables. P < 0.05 was considered as a significant association. A total of 108 students participated in this study. The results showed good knowledge of antibiotic use among pharmacy students. Female participants showed slightly higher knowledge as compared to their male counterpart; however, the difference was not supported by the statistical analysis. Those living with family and in urban/semi-urban areas appeared to be more knowledgeable as compared to their respective groups, though the difference was not statistically significant. The inter-relation of knowledge of antibiotic use and demographic variables is presented in [Table 1]. The knowledge of pharmacy students was remarkably high for most of the questions. All the participants correctly answered that inappropriate antibiotics lead to ineffective treatment. Similarly, 98.14% correctly identified antibiotic resistance as a serious public health issue. However, the proportion of students who correctly answered the question was quite low when asked about superbugs and their relation with antibiotics (53.7%). Likewise, only 62.03% correctly answered bacteria are not responsible for common cold and flu. The complete description of students' knowledge of antibiotic use is tabularized in [Table 2]. The overall attitude of pharmacy student was poor. A significant difference was observed between rural and urban respondents when asked whether antibiotics help in the prevention of illness during common cold and flu. Urban population agreed more to this statement as compared to rural respondent; however, overall, only 8.3% respondents agreed to this statement. One-fourth of the participants believed that antibiotics are safe and can be commonly used. Male respondents tend to agree more to this statement as compared to their female counterpart. Students' responses to various attitude questions are mentioned in [Table 3]. The results showed that three-fourths of pharmacy students rarely use antibiotics while self-decision was the major reason of antibiotic use (40.7%). 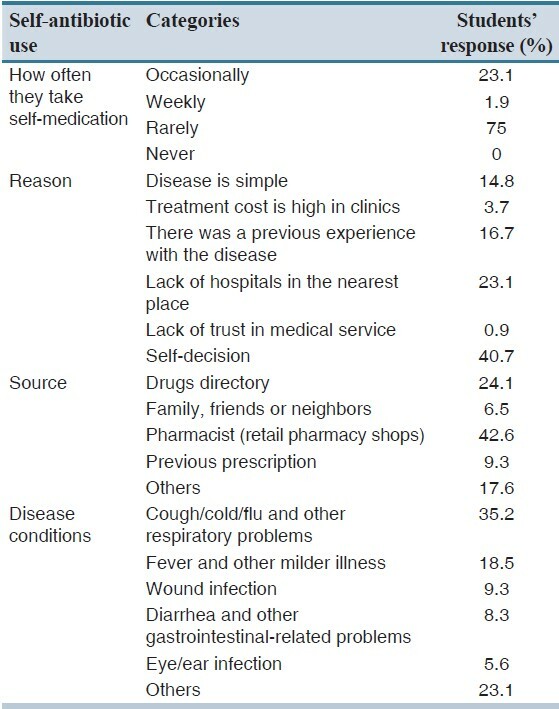 The main source of information about antibiotics was pharmacist available on retail shop (42.6%). Common cold and flu is a major problem for which antibiotics were mainly utilized by pharmacy students (35.2%). The results of self-antibiotic practice are presented in [Table 4]. Penicillins were the commonly used drugs reported by pharmacy students (34%). Another aspect of this study highlighted the students' response on the possible causes of antibiotic resistance. A remarkable variation in the responses was noted when asked whether empirical therapy could be a possible cause of antibiotic resistance, as 50% of students agreed to this statement. Similarly, 61.1% of students identified excessive antibiotic use in livestock as a likely cause of antibiotic resistance. Moreover, majority of students agreed that mutational and evolutionary changes in the micro-organism (88.9%) and Lack of restrictions on antibiotic usage (83.3%) are the potential causes of antibiotic resistance [Table 5]. The study examined the KAP of antibiotic use and resistance among senior pharmacy students in Trinidad and Tobago. To the best of our knowledge, this is the first study which has examined KAP among pharmacy students in Trinidad and Tobago. A large proportion of pharmacy students in this study rarely used nonprescribed antibiotics. The results are in line with other published study which also reported the same. Cough, cold, and flu were the major problems for which antibiotics were used commonly by the students. The results are in accordance to a study where common cold was the major cause of antibiotics self-practices. In contrast, the results were more discouraging when a study reported that 60% of their participants recommended antibiotics for viral infections. Outcome based education could be an effective approach to bridge the gap between from knowledge to practice. The strength of this study is that it addresses the major issue of antibiotic use and resistance in Trinidad. The other potential feature of this study is that it selected senior pharmacy students as a sample population on which not much research has been done in the past. The findings of this study would urge the researchers to explore this area by recruiting more students from other schools of faculty of medical sciences. However, like any other study, this research also has some limitations. The convenience sampling approach of recruitment of one pharmacy school may limit the generalizability of the results. However, it is pertinent to mention that this is the only school offering pharmacy education in small islands of Trinidad and Tobago. As a general limitation to knowledge and attitude research, we cannot ignore the tendency of participants to provide more socially desirable results. The study showed good knowledge of pharmacy students regarding antibiotic use. However, students' attitude towards antibiotic use was poor. Self-decision was the major reason which persuaded pharmacy students for self-antibiotic use most commonly in common cold and other upper respiratory problems. The findings showed mutational and evolutionary changes in microorganism as the most important, and empirical therapy as the least important cause of antibiotic resistance. The study recommends future researchers to design effective interventions to improve the knowledge and attitude of pharmacy students about antibiotic usage and resistance in Trinidad and Tobago. WHO. The Evolving Threat of Antimicrobial Resistance: Options for Action; 2012. Available from: http://www.whqlibdoc.who.int/publications/2012/9789241503181_eng.pdf. [Last cited on 2014 Aug 10]. Vila J, Pal T. Update on antimicrobial resistance in low-income countries: Factors favoring the emergence of resistance. Open Infect Dis J 2010;4:38-54. World Health Organization. Global Strategy for the Containment of Antimicrobial Resistance. Geneva: WHO; 2001. Available from: http://www.who.int/drugresistance/WHO_Global_Strategy_English.pdf. [Last cited on 2014 Aug 10]. Cars O, Nordberg P. Antibiotic resistance - The faceless threat. Int J Risk Saf Med 2005;17:103-10. Grigoryan L, Burgerhof JG, Degener JE, Deschepper R, Lundborg CS, Monnet DL, et al. Determinants of self-medication with antibiotics in Europe: The impact of beliefs, country wealth and the healthcare system. J Antimicrob Chemother 2008;61:1172-9. Wright EP, Jain P. Survey of antibiotic knowledge amongst final year medical students. J Antimicrob Chemother 2004;53:550-1. Steinberg I. Clinical choices of antibiotics: Judging judicious use. Am J Manag Care 2000;6:S1178-88. Jamshed SQ, Elkalmi R, Rajiah K, Al-Shami AK, Shamsudin SH, Siddiqui MJ, et al. Understanding of antibiotic use and resistance among final-year pharmacy and medical students: A pilot study. J Infect Dev Ctries 2014;8:780-5. Khan AK, Banu G, Reshma KK. Antibiotic resistance and usage-A survey on the knowledge, attitude, perceptions and practices among the medical students of a Southern Indian teaching hospital. J Clin Diagn Res 2013;7:1613-6. Mungrue K, Brown T, Hayes I, Ramroop S, Thurston P, Pereira LP. Drugs in upper respiratory tract infections in paediatric patients in North Trinidad. Pharm Pract (Granada) 2009;7:29-33. Kolluru S, Roesch DM, de la Fuente AA. A multi-instructor, team-based, active-learning exercise to integrate basic and clinical sciences content. Am J Pharm Educ 2012;76:33. Mitsi G, Jelastopulu E, Basiaris H, Skoutelis A, Gogos C. Patterns of antibiotic use among adults and parents in the community: A questionnaire-based survey in a Greek urban population. Int J Antimicrob Agents 2005;25:439-43. Azevedo MM, Pinheiro C, Yaphe J, Baltazar F. Portuguese students′ knowledge of antibiotics: A cross-sectional study of secondary school and university students in Braga. BMC Public Health 2009;9:359. Chambless DL, Hollon SD. Defining empirically supported therapies. J Consult Clin Psychol 1998;66:7-18.